SPT stands for Specific Physical Training and it was purposely developed by Coach Lee to increase Endurance, Power/Strength and Flexibility through archery specific muscle exercises using archery equipment. 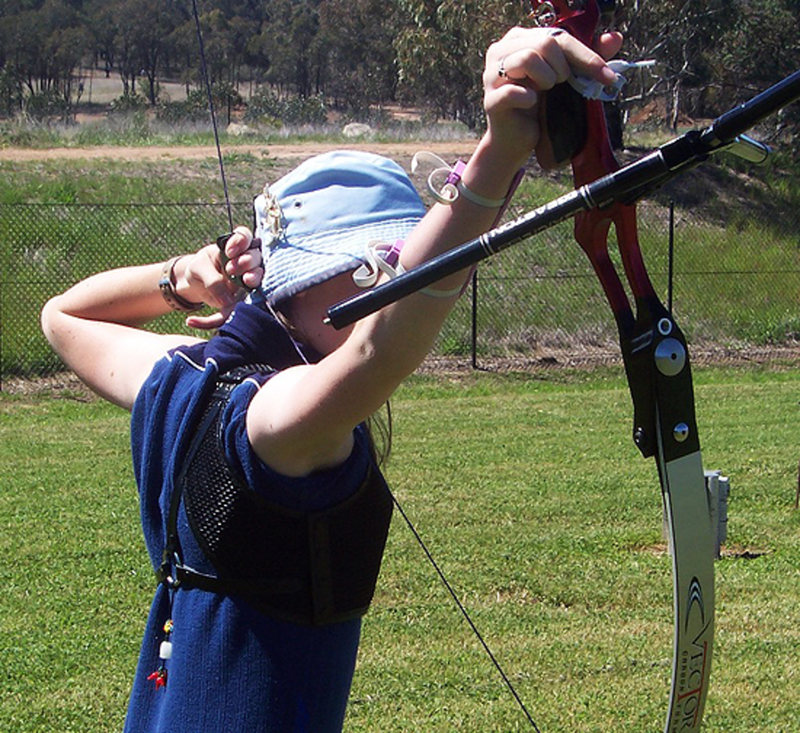 There are four specific SPT exercises as detailed in Total Archery - Endurance, Power/Strength, Flexibility and Structure. As noted recently by one of the Resident Archers at Chula Vista, USA archers at the Training Center have discovered that there are three things you can be sure of in life - Death, Taxes and SPT. Recently, a new meaning has been attached to SPT by one of the other Resident Archers, referring to it as, "Severe Physical Torture". The bow is drawn in the normal manner, using correct technique, but without an arrow; hold for 30 seconds to 1 minute. The rest time, between each repetition, should be double the "Hold Time"; e.g. hold for 35 seconds then rest time will be double this or 70 seconds. After 10 repetitions take 2 minutes rest and repeat - Duration 30 minutes. This exercise must be done with proper form, incorporating aiming, otherwise bow will move all over place when fatigue starts to set in. Note: When the archer can hold for more than 45 seconds, some rubber bands can be introduced slipped over the limbs to increase draw weight by about 2 - 3 lbs. Alternatively a heavier bow can be used. Draw from the Set-Up to the Holding position; Holding must include Transfer and Loading like in a normal shot. Hold for 3 - 5 seconds and let down, but only as far down as the Set-up, then draw straight back to the anchor position and, again, include Transfer and Loading. Do this 5 -12 times for 3 - 5 sets, depending on current strength. Rest period between sets 3 - 5 minutes - Ensure that proper alignment and form is maintained - Duration 30 minutes. In this exercise the string is pulled behind the neck, see photo. 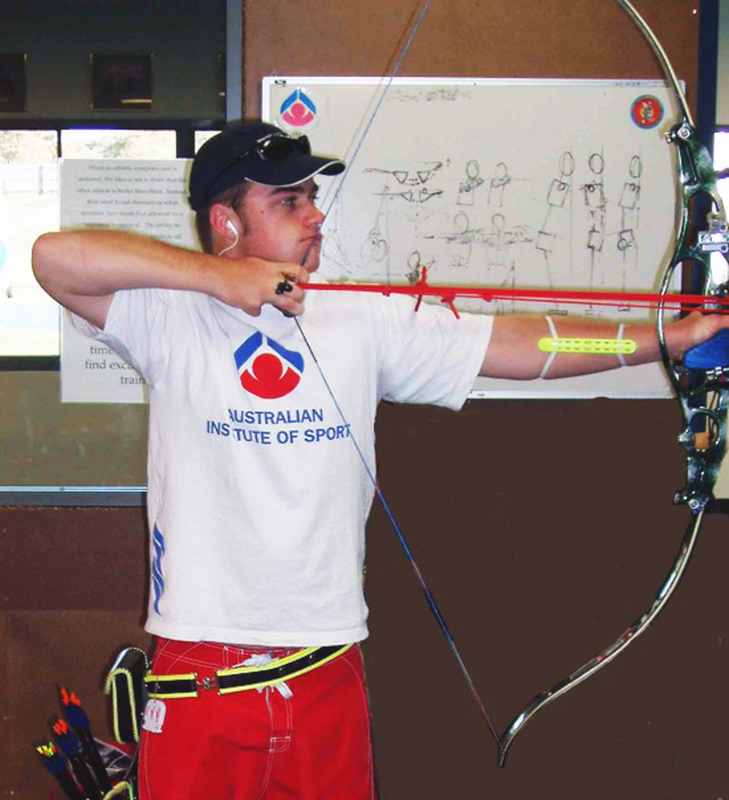 This exercise is more an exercise to give the archer the feeling for the position where both the shoulders should be. From time to time I use this exercise for this purpose, i.e. when an archer has problems attaining the correct shoulder positions. This SPT 4 is also good for warm up purposes, including before the start of competition. These SPT exercises are carried out by elite archers religiously, 5 days a week for 1 full hour. If ever there was an exercise that fitted the adage, "No Pain, No Gain" try doing these SPT exercises for one hour every day. Please note that these exercises are in addition to specific endurance weight training, which mainly focuses on the Power-Zone, a subject we will touch on in the near future. For further details, also see response to question 12 in the Frequently Asked Questions section.